The RESNET EnergySmart Contractor designation is a company credential (one full-time employee must complete training and pass the exam). It allows you to work with homeowners to improve their comfort and safety, and help them reduce their energy bills. You will be credentialed to work in concert with certified energy auditors to complete home performance improvement work in compliance with RESNET's work scope standards of practice. Begin the online course immediately and take up to 30 days to complete. Why Be an EnergySmart Contractor? The RESNET EnergySmart Contractor designation is a company credential (one full-time employee must complete training and pass the exam). It allows you to work with homeowners to improve their comfort and safety, and help them reduce their energy bills. You will be credentialed to work in concert with certified energy auditors to complete home performance improvement work in compliance with RESNET's work scope standards of practice. Begin the online course immediately and take up to 30 days to complete. Our 100% Success Guarantee If you don't pass your certification exam(s) for any reason, you can re-take our course curriculum* at no additional charge until you achieve a passing grade. You will be qualified to include optimal home performance measures in your contracting business. You will be able to work with homeowners to improve their comfort and safety, and help them reduce their energy bills. Your RESNET EnergySmart Contractor certification increases your credibility, which helps you close jobs and grow your business. You will be able to join RESNET EnergySmart Home Performance Teams, and work with certified RESNET Raters and Auditors, and EnergySmart Contractors in other trades to improve a home's energy efficiency. Homeowners may be required to work with qualified Home Performance Teams to qualify for various incentive programs. We will help you build a home performance business (or add home performance to your existing business) with our Home Energy Team complete business solution. Our EnergySmart Contractor Training Package includes your Contractor Education & Quality (CEQ) Provider fee for the first year. After the first year you will need to purchase a CEQ Provider service. Companies with a certified BPI Analyst do not need to take the EnergySmart training or exam, but they do need to sign up with a CEQ Provider in order to receive their EnergySmart certification. The EnergySmart Contractors course qualifies you to become a RESNET member and be listed on their contractor directory. For more information, contact RESNET at 1-800-785-7057. 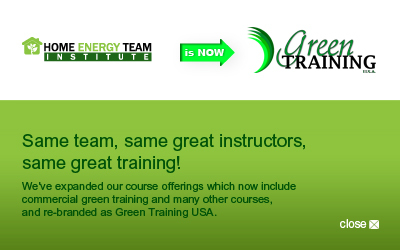 What Other Courses Does Green Training USA Offer?